A Client Policy controls which settings are available to configure on the user’s Parallels Client interface. With the Client Policy, the IT administrator can also force settings within these group tabs. 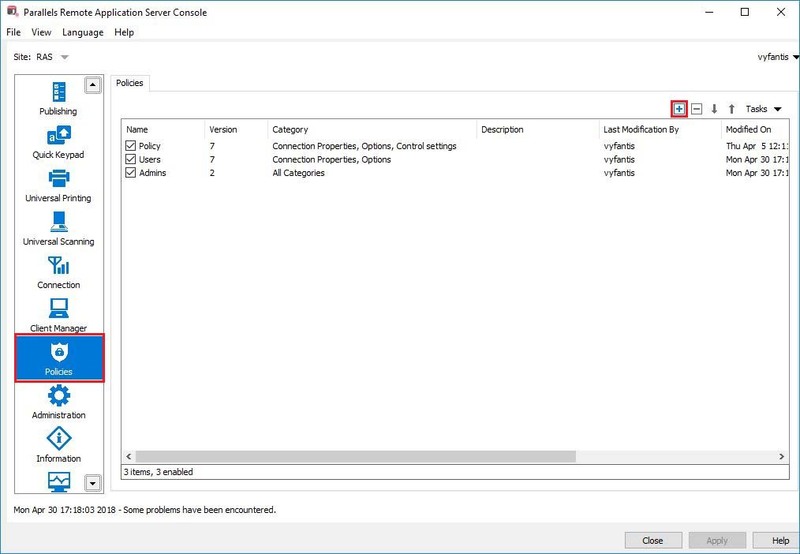 This allows IT administrators to easily manage and restrict the settings available to users on the Parallels Client connection to a Parallels® Remote Application Server (RAS) Farm. Criteria can also be configured to distribute different policies depending from where the user is connecting or even which device (MAC address). This is particularly useful if an IT administrator wants to lock down what clients can access and configure, depending on where or what device they are connecting from. 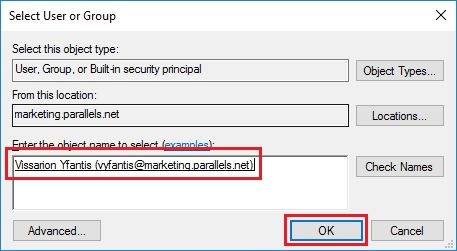 Granular Client Policies are available on all the platforms that support Parallels Client, meaning that the settings can be configured to apply to any device running the Parallels Client to establish a connection to a Parallels RAS Farm, to access published resources such as published applications and published desktops. 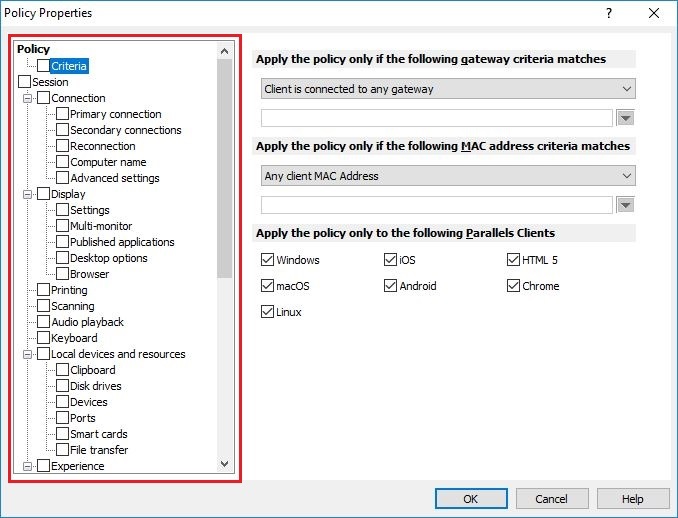 Configure client policies within the Parallels RAS Console by clicking the “Policies” category on the left-side menu and then clicking the “+” symbol marked in red below. The next step is to add the user that this Client Policy will apply to. By selecting “Policy” from the left-side menu and clicking the “+” symbol marked in red below, you specify which user you want to add on this policy. Next “Criteria“setting provides you with the gateway and Parallels Client options that can be applied to. You can select either a whole group category to be forced on the client or only some specific components. For example, you may want to force specific display or keyboard settings. Additionally, you can restrict a user to be able to use Single Sign-on or make use of the printing facility in your farm. 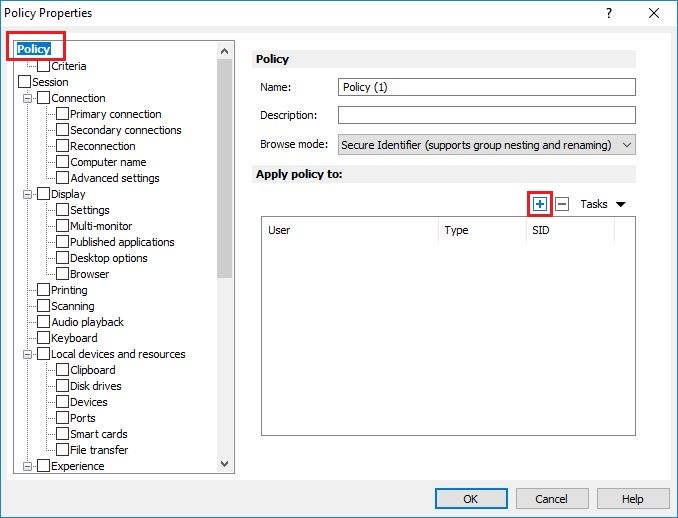 Click OK on the Policy Properties windows to save your policy settings and Apply on the Parallels RAS Console to apply them. SPLA Sublicensing with Parallels RAS. Easy-to-use and cost-effective.